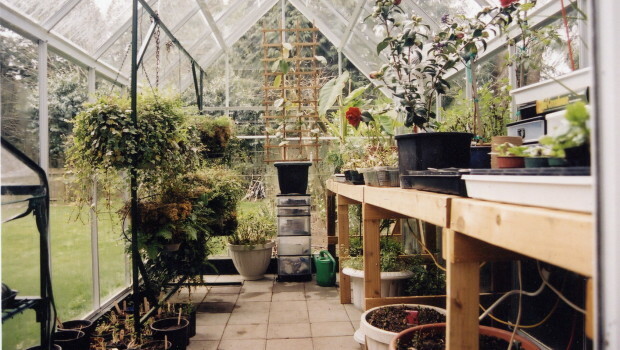 As we near the end of August, now is the time to prepare your greenhouse for the upcoming cold weather. If your greenhouse does not have a heating system and you close it during the winter months, it will need to be cleaned thoroughly and minor repairs completed in preparation for the following spring. Remove any plants that are seasonal and will not last in cooler temperatures of a winter greenhouse. Make sure they are not diseased and use them for composting. Sweep floors, discard empty bags and throw out chipped and broken containers. Give the floor a good washing with soap and water. Hose the floor down to eliminate any soap residue or left over soil particles. Wash the greenhouse glazing with mild detergent and water to allow as much sunlight into the greenhouse during the winter months. Wash the framework, benches and any other props used in the greenhouse. Remove and wash any shading material. 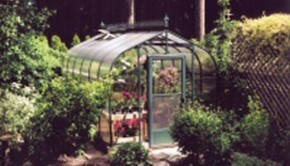 Check the greenhouse glazing to make sure there are no cracks or spaces. There can often be shifting with heat changes. Inspect the insulation for any gaps that could have developed and fix them using simple calking or expandable foam. Add extra insulation on the north wall for the winter. It is easy to add extra insulation by lining the interior greenhouse walls with plastic sheeting or bubble wrap. Examine heaters thoroughly and hire a professional to light the burners if necessary. Check exhausts, vents and ducts if you have them. Fill oil, propane or gas tanks. Drain water lines and cover outside faucets with insulation. Use light bulbs to create additional heat where needed. Create a heat sink (see previous blog for how-to instructions). Before outside plants are transferred into the greenhouse for the winter, inspect and insure that they are completely pest and disease free. 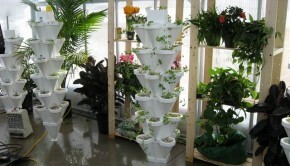 Bring your plants indoors and your greenhouse is ready for the fall and winter season. Tip: To rid plants of unwanted pests, take them out of the greenhouse and run the garden hose through the pot for a good 5 minutes or so. This will flush out any pests that may be within the soil. Once that is completed, spray the plant with a pesticide, store bought or home-made, wrap in a plastic bag for 24 hours and that will kill off any remaining pests that were not flushed out with the soil. I have a question. We have just built a greenhouse with a concrete floor and want to put cedar raised beds on the floor. We are worried about water and soil eventually leaking through the cracks and the bottom of the raised beds and are considering lining the boxes with poly and putting gravel in the bottom for drainage. Is this advisable? What is the best option? You definitely need a good drainage option for the plants, otherwise you will experience root rot and the plants will die. It won’t hurt the concrete floor if the soil and water land there. Gravel is a good idea as well.